Chemical flooding can be the most complex enhanced oil recovery technique because how the surfactant partitions between oil and water drastically affects performance. The short easy description of the process is that chemical and polymer injection alter the mobility of oil by a) altering both the oil and water relative permeability curves, b) reducing residual oil saturation and c) reducing the mobility of water with polymer. The first two of these occur because the interfacial tension (IFT) between oil and water is reduced. The first figure below shows that the IFT between an oil and water is reduced three orders of magnitude when an alkali (Na2CO3) is added to the water. This occurs because surfactant the alkali reacts with acids such as phenols and carboxcylic acids in the oil to form soaps. The amount of acids in the oil is represented by its acid number. This curve passed through a minimum and rises as more soaps form and some partition into the oil phase rather than remaining at the oil water interface. If a synthetic soap with more hydrophilic parts is added to the water, the natural soaps are kept at the oil water interface and the interfacial tension remains low over a wider range of alkali concentration. This is a good thing because it will be necessary to inject a concentration 1.5 to 2 percent alkali to satisfy its consumption. The figure shows the effect of addition of both alkali and surfactant. This is called ASP flooding (Alkali Surfactant Polymer). Similar figures could be created if a higher concentration surfactant were used without alkali (SP Flooding). Where v is the velocity of the front, μw is the viscosity of water and polymer and σ is the oil-water interfacial tension discussed above. The second figure is a plot of fraction of residual oil that is recovered from corefloods versus the capillary number, Nc. The figure shows that most of the recovery of non-wetting oil is very effective by the time the capillary number is 0.0001 or 0.001. Since the capillary number for oil and water is 0.00000001, a ASP, SP or AP flood should be effective when the capillary number is increased by three or four orders of magnitude. This means that the interfacial tension, σ, shown must be reduced by three to four orders of magnitude. Thus, keeping IFT’s around 0.001 or less results in high oil production. It is also helpful to increase the viscosity of water, μw, with polymer since this also increases the capillary number. It was noted previously that salinity affects surfactant behavior. The figure on the left below shows how increasing salinity changes surfactant phase behavior. Initially the surfactant is in the water and forms a microemulsion of oil in water. Increasing salinity causes formation of a middle-phase microemulsion that contains most of the surfactant. This is desirable in a chemical flood because the IFT’s are lowest at that point and oil and water are essentially miscible. As the salinity is increased farther, the surfactant is forced into the oil and a water-in-oil emulsion forms which can be quite viscous and be bypassed by the lower-salinity, chase- polymer solution. 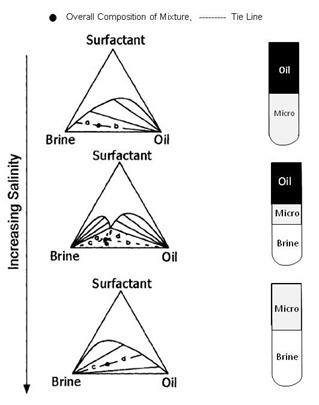 The previous discussion represents classical surfactant flooding theory which is effective for recovering almost all of the oil from a coreflood, but isn’t necessarily more profitable to apply than low concentration surfactant floods or ASP floods which just reduce IFT and don’t form robust middle-phase micro emulsions that occur over a wide range of salinities. Wellington and Richardson and others show that the oil is mobilized by a low concentration of surfactant. The figure on the right is an example. 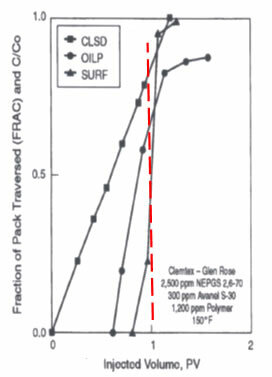 The figure shows the location of the clean sand zone (CLSD), fraction of oil produced (OILP) and fraction in injected surfactant produced in an experiment. The red line shows that when 20 percent of the surfactant was being produced, 70 percent of the residual oil had been produced and the 80 percent of the sand pack was free of oil. The authors claim that this shows that the toe (first 20 percent) of surfactant produced most of the oil. Behavior like this is very common and results in the most profitable chemical floods even though less oil might be recovered.